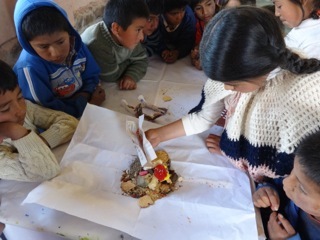 Last week the Escuela Bonita Pachamama Mural series were completed and hung on the walls of the school. The typical labyrinth exercises, games, escuela perro, and puzzles were additional forms of exercise. This final week, we watched the animated film: The legend of the guardians which is an adventurous tale of owls, the hero’s journey and such. In the aftermath there is additional documentary (short for kid’s attention spans) on the plight of the modern day owl and how environmentalists and owl fans are working to restore habitat for these noble creatures. Facts about their superior vision and hearing, their nocturnal lifestyle, and their abilities to turn their heads 190 degrees each way were some of the highlights. 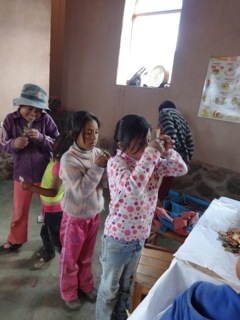 I then shared with the children the feathers of an owl wing I found jogging up the hill away fromMaras. 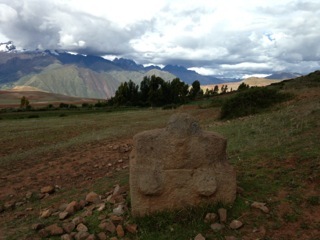 Tomorrow we have plans to do one last labyrinth, esceula perro, and if weather permits, I hope to walk them up to an Incan rock I discovered up the hill beyond the compound where this incredible rock sits. A pako here told me it was a “Cosmic Mirror” as it has a concave opening where water gathers so that the participant sees themselves as “light” beings. The sides of the rock have the telltale “knobs”, the insignia of Incan waka (sacred) altars. 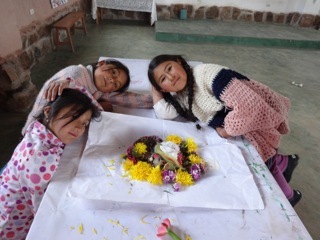 (see photo) Finally, we we collectively do a despacho ceremony honoring the apus and pachamama and offering a final set of intentions to the ethers. Gracias Tim Carol and Jose Luis for this amazing opportunity.